Pimples …Pimples…Pimples…I hate those pimples on my face. Pimples are the common problems in every life of teenagers. Pimples had created a mess in my life too. I still remember those days. I would look out for new pimples every morning and end the whole day thinking about ways to manage the horrible marks left by pimple on my face. Getting rid of prospective pimples or marks left by pimples is the worst problem to stumble upon. I tried all the medicines and home remedies to get rid of these pimples. However none of the remedies worked on me. Gradually I started to loose the confidence in me. If there were any occasions or party with family or friends, I would be ashamed to go out with pimples or pimple marked face. I would mostly lock myself in the room. Sometimes in the crowd, I used to feel neglected. Besides, I always used to give excuses to hide my pimple face. Finally, how can I forget that I had also stopped having my favorite spicy food and most of junk items. As I am foodie, it was very hard for me to stay away from my favorite food items but I still convinced myself to do it. It was just like break up between two intense lovers. My story can be the best example for this Hindi line -”Kuch pane ke liye kuch khona padhata hai” which means “no pains then no gains”. This saying perfectly fits to my sorrow. Girls want to look beautiful with flawless skin. But the pimples pull down such aspirations. Over the years, I have learnt that instead of getting panicked it is better to look out for a better solution that can get rid of pimples. 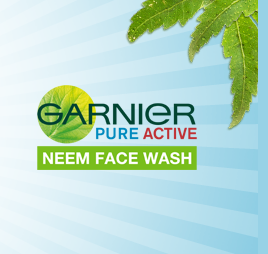 After many search and trials, at last I found the Garnier Pure Neem Active face wash. It is a neem based face wash and it suits well for normal to oily skin. This face wash helps to cleanse the skin to remove oil and dirt. It also helps in controlling the pimples. · First step is to wet your face with warm water. Never use hot water to wash the face because hot water can dehydrate the skin and damage it off. · Second step is to apply a small amount of garnier pure active neem face wash. Massage it with your fingers in circular movements for just 40 seconds. Rinse the face with warm water. · Third step is to pat dry your face with clean towel. Do not rub the towel on your face. · Fourth step is to apply moisturizer and gently massage into the skin. Try to use good moisturizer that best suits your skin type. Lastly I can say that Garnier Pure Active Neem really helped me to overcome the problem of the pimples. Now I am a happy person and all set to enjoy any occasion with strong faith and good confidence, which I had lost earlier. 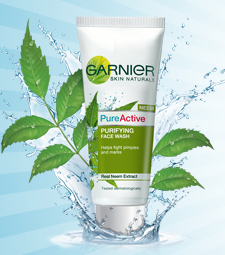 This post is written for Garnier Pure Active Neem Contest hosted by Indiblogger.